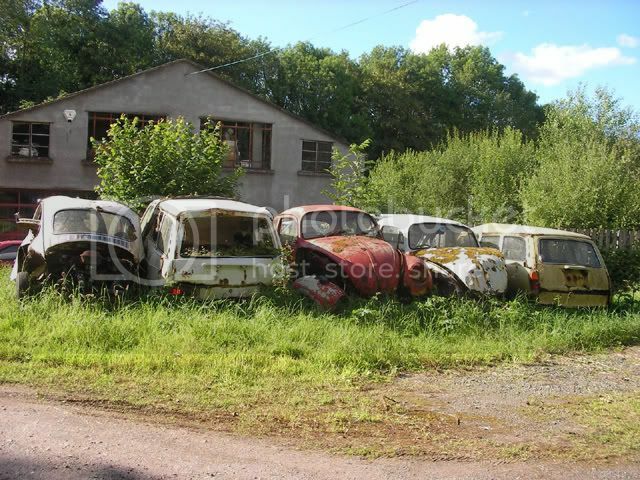 Photos of derelict / unrestored cars, vans and pickups! 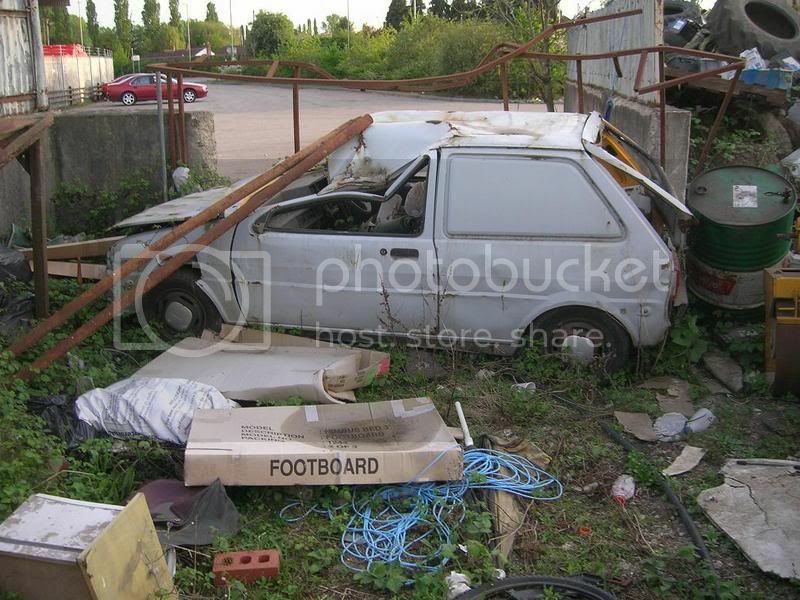 Posted: Wed Jun 20, 2007 8:56 am Post subject: Photos of derelict / unrestored cars, vans and pickups! If you have any pics that you've taken, and would be willing to email them over, that would be fab. I'd credit the photo source naturally! I need them to be photos that you have taken, or that you know who took them and they agree to them being used here. Unfortunately I can't really use pics found on other sites (including eBay sadly), just those where the 'taker' is known and is ok with the pics used here. High resolution pics are best please - emailed to dodgenut@4onthefloor.co.uk - and if you have any details of where/when the pics were taken, even better! 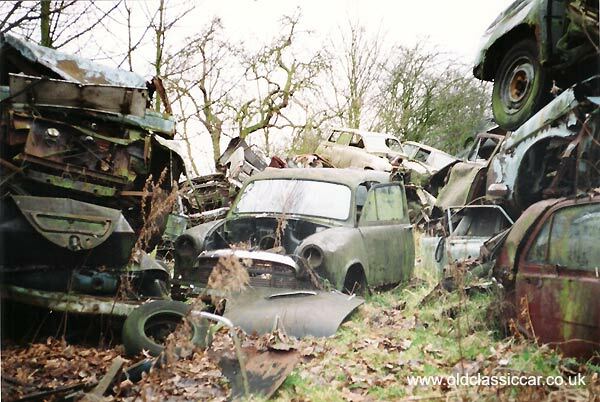 Here's an example, taken by me in a scrapyard 16 years or so ago, now sadly cleared for housing.. There is a tractor parked in a farmyard not 200 yards from here, I often think of taking a photo when I pass but never have the camera handy! I shall toddle off later and send in the photo. Shed a tear for this rare car, some clown in a Vanguard ran into the side of me in Tenterden High st. It had other problems as well and when this photo was taken it had been standing for some time. A friend bought it off me and intended to do it up but it shortly found its way to the breakers yard. 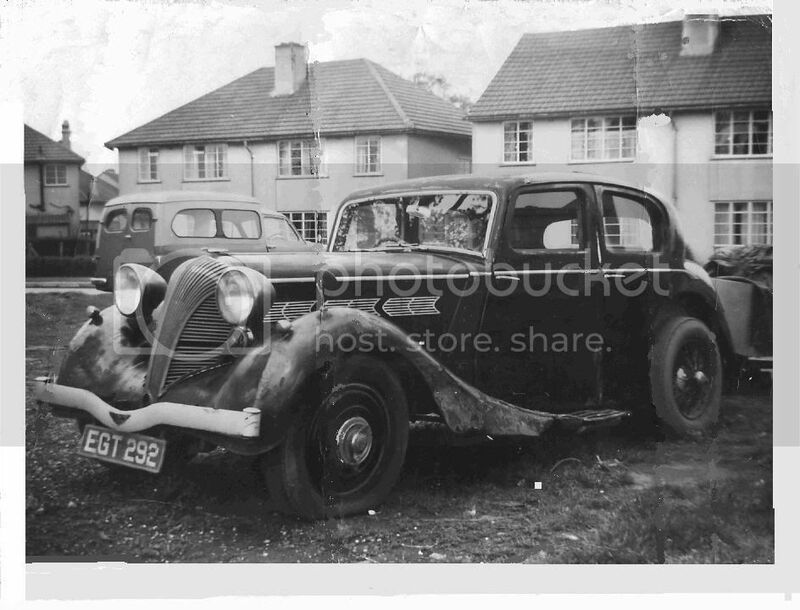 Note it is 1962, the car has been standing next to a council estate and it was never vandalised. How times have changed. by gum that was a tasty looking set of wheels!!! great pic, thanks for scanning that in!! I also posted it on a pre-war Triumph site and they tell me it is going to be used in a forthcoming book on the marque. Saw this in a field in Norfolk a couple of years back. There might have been a skeleton of a "mod" in the bushes somewhere, did you look? No, not a skeleton, but I did find an old green Parker with 5 bullet holes in the target on the back!! Heres a couple more for you, not far from me either. Somewhere in the darkest depths of Kent there is a small run-down pub run by a octogenarian. He very seldom seems to open these days but as long as I have known about it (27 years) he has had a dozen, or so, old cars gently decaying around the premises., these are often sprinkled with newish cars to give the impression that the pub is busy. 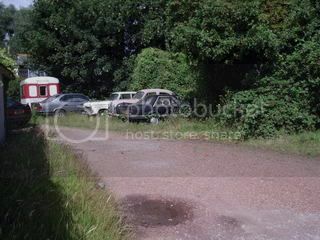 The photo shows the few that can be seen from the road but I believe there are many more around the building. I might risk having to buy a drink there to find out. 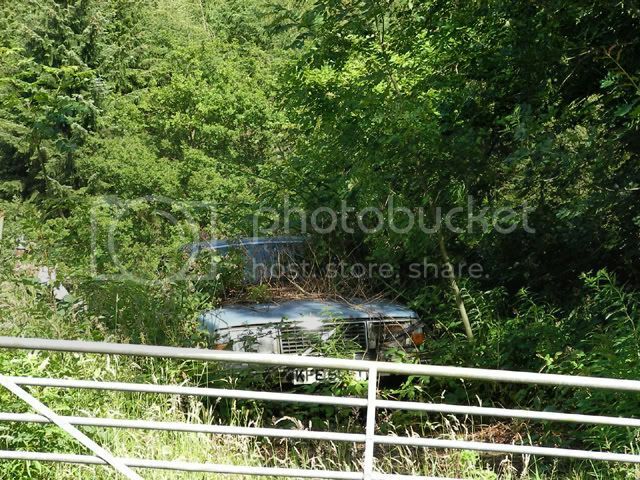 I reckon there is a B series engined Farina bodied BLMC, and is the other light coloured car one of the 80,90 or 100 Rovers? A cracking looking caravan as well. 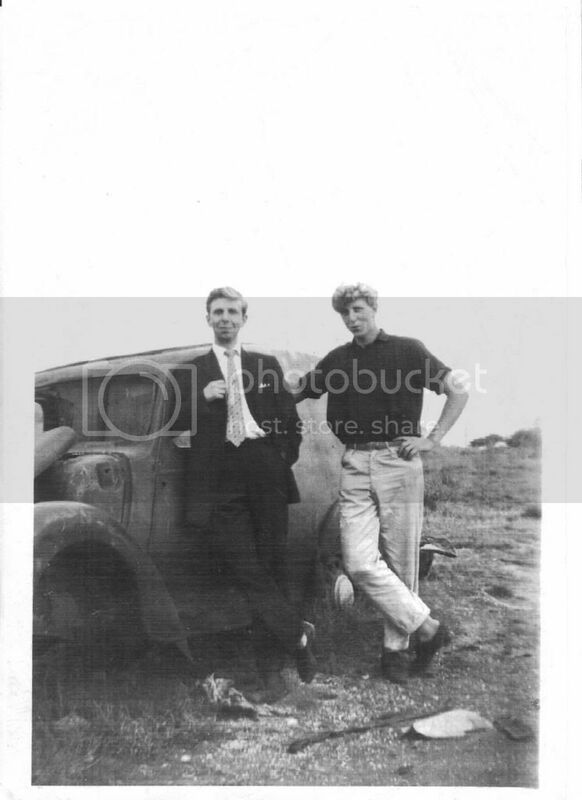 Another one found in the family album of me and my "little bruvver" posing alongside the shell of and Austin 8 van, bought to cannibilize in order to keep mine on the road. I probably paid about £5 for it and it provided me with a set of good wheels and tyres, a good engine and various other useful bits. The thing that makes me sad is the fact that it was sound-as-a bell with no rot or body damage, but was worthless in those days. Did I really dress like a "pox doctors clerk" in 1959?